The guys from OzBoxLive have announced a brand new game night which will be raising funds for the Australian Royal Children's Hospital. Check out the details below for more info. Come in and experience some of the best XBOX 360 games with an evening of modern, multiplayer, and online XBOX 360 games, such as Guitar Hero: World Tour, Halo 3, Harry Potter and the Half-Blood Prince, Street Fighter IV, and Sacred 2. There’ll also be giveaways and opportunities to win major prizes*, including an XBOX 360 & games pack. All funds raised on the night will be going to benefit the Royal Children’s Hospital. So engage with XBOX 360 gaming and help others at the same time! Presented in association with OzBoxLive. Australia's best Xbox 360 podcast has recently released it's latest episode. OzBoxLive is now available for your listening please from the official OzBoxLive Radio website. 1 March 2009 – Melbourne, Australia – OzBoxLive Radio has just released the first episode for the year of their world famous podcast show. This brings the show into the fourth season of an Xbox only podcast dedicated to the Australian and New Zealand market. This new episode has a few small changes in order to get the show under an hour. 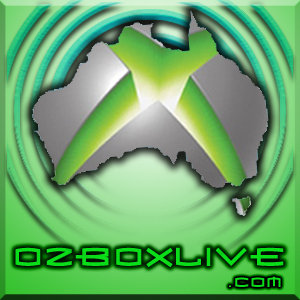 OzBoxLive Radio brings listeners the latest Xbox 360 News with different members of the team. A) the new releases on the shelves B) new content on Xbox Live and C) The latest issue of the magazine by Derwent Howard - Australian 360. The next segment is the Interview with Key members of the Video Game Community. As always they are recorded over Xbox Live, making the show unique for actually using the Xbox 360 console to help produce the show. Then there is the XBLA Game of The Week with ManlySey sharing (in a very entertaining way) his thoughts on the game and why listeners should purchase the title. Finally we have the Group Discussion with members of the OzBoxLive Radio team. We then end the show with a new competition where the winner will receive the next issue of Australian 360 and an XBLA game. This new season premiere also introduces music from the band Then There Were Two which is used exclusively throughout the show. As well as the introduction of Video Reviews on OzBoxLive TV, which will appear on YouTube. Also new is the OzBoxLive FaceBook Page allowing members to enter exclusive competitions and communicate with the team. Finally with the support of Microsoft Australia, OzBoxLive is now on Xbox Live in the new EVENTS Channel with the Community Playdate program. Check out the website at www.OzBoxLive.com for more details. Sorry for the delay guys but here is the latest edition of one of Australia's best Xbox 360 podcasts. OzBoxLive is now available for your listening please from the official site. Head over to www.OzBoxLive.com and check out this FINAL episode. If your looking for previous info for OzBoxLive Radio please use the search link located below as it will link you to all our OzBoxLive Radio information and news. The latest edition of Australia's hottest Xbox 360 podcast OzBoxLive is now available for your listening pleasure from the official site. What would you do to make the NEXT Xbox console a hit in Japan? You could win a copy of Dynasty Warriors - GUNDAM, along with a copy of Australian 360 AND a “Making of - MASS EFFECT DVD“, AND a Halo 3 Bag worth $50 Bucks AND lots more goodies. REMEMBER our final OzBoxLive Game Night is this Sunday. We are playing HALO 3. Go to www.OZBOXLIVE.com Now to sign up and check out the latest episode. Why Do You Love The Xbox 360? You could win a copy of Dynasty Warriors 6 thanks to THQ, along with a copy of The Official Australian Xbox Magazine AND a “Making of - MASS EFFECT DVD“, AND a Halo 3 Bag worth $50 Bucks AND lots more goodies.